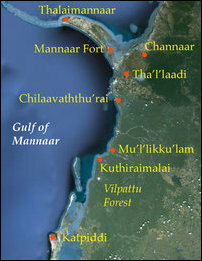 More than 200 Tamil families were living in Mu'l'lik-ku'lam eleven years before, in 2007, when the Sinhala military of genocidal Sri Lanka seized the coastal village facing towards the Gulf of Mannaar. Last year, the occupying SL Navy said it would consider handing over a small pocket of 77 acres of the total 5,000 acres back to the people, after ten years of protests and finally the people waging a continuous protest for 38 days in March and April 2017. However, the SL Navy didn't clear the lands and hand them over to the people despite repeated requests. The promise was a deceptive move aimed at containing the protest. However, around 50 of the 200 families have now chosen to enter the lands by themselves. They are now confined to the lands, which the SL Navy said it was prepared to release, Catholic priests in Mannaar told TamilNet on Wednesday. Only around 50 families have entered the lands and that too after establishing their ownership through the Divisional Secretary, they further said. The SL Navy was not responding even after they were informed at least ten times by the Divisional Secretary, the people said. The DS was notifying the SL authorities and the SL Navy after completing surveying of the lands and verifying the identity of those who possess the rights over the lands. The SL Resettlement Ministry was not responding to the requests from the DS of Musali Division on releasing funds to clear the lands and to establish the necessary infrastructure to facilitate the resettlement. The uprooted Mu'l'likku'lam villagers, who were tired of witnessing repeated deceptions, chose to enter their lands following the footsteps of the uprooted Tamils from Ira'nai-theevu, who courageously undertook a sea-landing retaking their twin-islet north of Mannaar in April earlier this year. The Tamil politicians of the TNA were also ignorant to their plight as the SL authorities, the villagers complained. Whatever the TNA politicians from Mannaar did only contributed to contain their protests in the past, they added. The families have started to clear the bushes in their lands already on Wednesday. 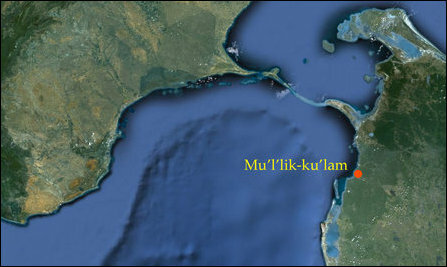 With several acres of fertile agricultural lands accompanying the coastal stretch with access to rich fishing-bed, the people of Mu'l'li-ku'lam were almost self-sufficient in their livelihood before 2007. Most of the nine lakes and ponds dotting the village consisting 5,000 acres of lands, provided water to their agriculture. Of 275 families living their, almost 200 had houses with permanent structures, and their living-standard looked bright even during the times of the war. 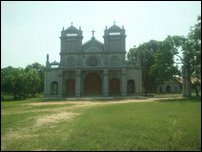 In September 2007, when the SL Army which uprooted the people, it initially told the people that it wanted to carry out a military clearance and allow the villagers to resettle after three days. However, it kept the people at out outside location for one month. Later asked them to reside with their relatives and grabbed the entire village and handed it over to the SL Navy, which transformed it into the North Western Naval area headquarters in 2010. In January 2013, Sinhala Archbishop from Colombo and a Cardinal of Vatican, His Eminence Malcolm Ranjith, had personally come along with genocidal Colombo’s Defence Secretary Gotabhaya Rajapaksa in grabbing Mu’l’lik-ku’lam village for the SL Navy. Mr Gotabhaya declared the village out of bounds for its resettling inhabitants. The people were promised housing schemes and alternative lands with ‘state of the art’ standard by Gotabhaya and Malcolm Ranjith. However, the people were let down to languish without proper infrastructure and livelihood at Kaayaa-kuzhi and Malang-kaadu while SL Navy personnel were occupying their houses at Mu'l'lik-ku'lam. The uprooted people were not even provided with humanitarian assistance or compensation as promised by Gotabhaya and Malcolm Ranjith. Only around 30 houses have survived with their structures. All the remaining homes have been destroyed. Last year, when the people staged their continues protest, they were deceptively asked to enter the village and stay inside the church. The SL Navy didn't release the LDO permit lands as promised. The lands for which people have deeds were not included. 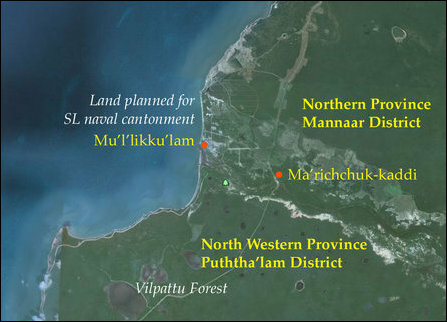 In reality, the SL Navy is only stationed in 35 acres, but it retained hundreds of acres of lands in Mu'l'lik-ku'lam other villages in the neighbourhood in the Musali division, the uprooted people say. 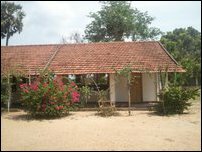 The village was previously under the LTTE-administered de-facto state of Tamil Eelam. Most of the residential lands, including the public properties such as the school and the Multi-Purpose Cooperative Society are yet to be released. In the meantime, there have also been reports of SL Navy scheming commercial exploitation of the area in collaboration with private companies, both local and foreign, with the backing of Colombo's ministries and departments planning everything from garments industry to cashew plantation, concerned Tamil civil sources at the District Secretariat of Mannaar said. Mu'l'lik-ku'lam is located 45 km south of Mannaar city and to the north of Puththa'lam district. 11.03.19 118 Muslim families demand occupying SL Navy to re..
07.01.19 SL Navy restricts humanitarian access to resettlin..
31.12.18 Sirisena didn't keep word on resettling Tamil Cath..
22.10.18 SL Navy harasses resettled Tamils in Musali by blo..
18.07.18 Uprooted Mu'l'lik-ku'lam Tamils adopt Ira'nai-thee..
14.05.18 Ira'nai-theevu residents have all rights to resett..
02.05.18 NPC Chief Minister urged to witness Ira'nai-theevu..
24.04.18 Uprooted Tamils embark on courageous sea landing, ..
25.02.18 300 days and counting: uprooted people of Ira'nait..
31.12.17 Elder generation activists prepared to sacrifice l..
18.09.17 Uprooted people find houses destroyed by SL Navy i..
31.08.17 Ira'nai-theevu without Tamil people constitutes th..
25.08.17 SL Navy to be more genocidal in future: Premonitio..
07.08.17 SL military land grab in North-East constitutes ge..
25.06.17 Uprooted Mu'l'lik-ku'lam fishermen blocked from fr..
31.05.17 Stranded Mu'l'lik-ku'lam villagers seek attention ..
22.05.17 SL Forest Department suspected of shooting to kill..
09.05.17 Mu'l'lik-ku'lam people deceived again, SL Navy wan..
08.05.17 Uprooted Mu’l’lik-ku’lam families face harassment ..
26.04.17 SL military deploys sophisticated surveillance aga..
25.04.17 TNA under fire for dealing with SL military comman..
24.04.17 Keappaa-pulavu protesters denounce compromises, de..
20.04.17 SL deceptions multiply as protests demanding lands..
08.04.17 Time has come for joint action by protesting masse..
03.04.17 Protesting Musali villagers expose structural geno..
28.03.17 Muslims, Tamils protest against Colombo’s land gra..
24.03.17 Uprooted Tamils in Mannaaar launch continuous prot..
19.12.16 Resettled Sinhala farmers oppose genocidal colonis..
29.11.16 Solid resistance gives hopes towards resolving fis..
24.11.16 Mannaar Magistrate issues interim order against Si..
21.11.16 Colombo should revert Gazette notifications, retur..
09.11.16 Tamil, Muslim fishermen protest against Colombo's ..
08.11.16 Colombo silently schemes fresh Sinhala settlements..
04.11.16 SL Navy ‘revenge’ against Tamil fishermen continue..
21.10.16 Six fishermen arrested, SL Police ‘facilitates’ SL..
20.10.16 SLN expands naval detachment in Musali, steps up h..
19.10.16 SL Navy declares war on Tamil fishermen in Arippu,..
18.10.16 Tamil fishermen apprehend menacing Sinhala soldier..
11.05.16 Sinahalicisation of Musali division in Mannaar res..
01.01.16 De-militarize Mu’l’likku’lam in 2016: Uprooted Tam..
19.07.15 Colombo's military red tape prevails over civil ru..
02.07.15 Swaminthan continues ‘facilitation meetings’ betwe..
29.06.15 Swaminathan blames SL military for failure in rele..
30.05.15 Uprooted Musali Tamils demand lands back, SL Navy ..
27.02.15 Bathiudeen dictates affairs of Palmyra Development..
06.01.13 SL Archbishop collaborates with Gotabhaya in milit..
04.11.12 SL Navy continues to obstruct resettlement of disp..
17.06.12 SL Navy blocks resettlement-seeking Tamils from en..
15.09.11 Mu'l'likku'lam villagers left to languish, resettl..
02.07.08 HRW calls on GoSL to end illegal internment of IDP..
18.06.08 385 Tamil civilians languish in SLA detention in N..
11.05.08 Musali displaced harassed by SLA, 70 families flee..
07.03.08 SLN, Police instruct Vanni IDPs away from Mannaar ..
08.09.07 Mu'l'likku'lam villagers forced to walk 20km seeki..
03.09.07 SLA artillery fire kills one, injures another in M..
03.09.07 4500 civilians displaced from Musali to Naanaaddaa..
02.09.07 Civilian casualties in SLA Musali operation increa..
01.09.07 SLA uses Muslim villagers as human shields in Mann..
31.08.07 SLA Mannaar advance defeated, one body recovered -..